I knew if I actually stopped and considered my situation, I would find myself overcome with fear. 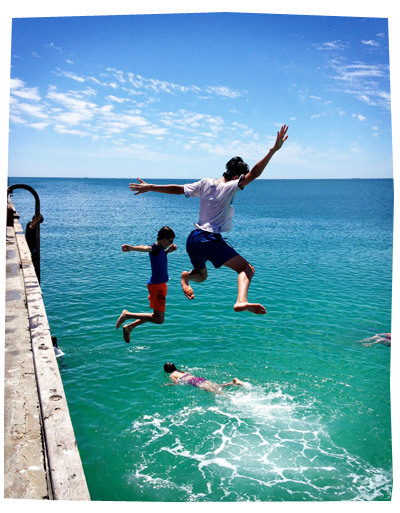 I took two fast steps towards the edge of the wooden jetty and leaped high into the air. In the 3 seconds before my feet touched the water, my senses exploded and I was suddenly so aware of the moment. As they say, it was as if time had frozen. 3 seconds is not very long. But curiously, it was long enough for me to have a conversation with myself, in my head. Stay upright. Don’t do anything silly. This will be over in a sec. You want to be alive at the end. Just hit the water with your feet. Don’t land on your back or head. Mother Karen has spoken. I’m weightless. I’m floating. I’m flying. I’m suspended in air. This feels unnatural. My hair is going to get wet. Thank you stating the obvious. I’m falling. Like in my dreams. This is a bit freaky. My stomach is going wobbly. I want to throw up. Oh god why am I taking so long to hit the water? I don’t like falling. I tense my body. As I hit the water, it swallowed me up. Cold fingers of water slid up my legs in an instant; up my stomach, up my chest, up my neck. It snaked around my ears, across my face, up over my head, like urgent hands pawing through my hair. The sky disappeared. The world turned blue. A white ceiling appeared above my head. The blue squeezes my chest and grips my face. It’s over. I’m cold. And I can’t breathe. Maybe I would have enjoyed it a lot more if I had just screamed, WAAAHHHOOOOOOOOOOO! !